Colours, just like music, trigger various emotions and effect consumer behaviour. 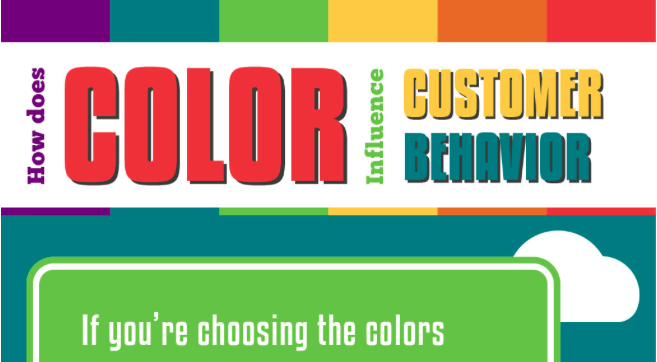 By using specific colour combination, one could influence customers’ buying decisions. Consumers say visual product appearance is the most important factor in making a purchase, and 85% of consumers are influenced by the colour of a product. Colours have different influences. For example, green influences thoughts of plants and nature. Yellow brings happiness and optimism. A warm colour changes purchasers’ perception as to the temperature of a product or environment. Used together, the colours blue and white and green can elicit trust. Black and green and blue can evoke security. Yellow and white and red can bring out speed or fastness. Yellow and brown and orange elicit the feeling of cheapness. Fear may be derived from red and gray and black combination. Warm colours, including red or orange or yellow, attract impulse buyers. Cool colours, such as light-blue or pink or navy, attract budget-conscious shoppers. Even single colours can affect buyer emotions. Green can make buyers feel relaxed, healthy, and peaceful. Yellow can make buyers feel enthusiastic, happy, and calm. Red can make buyers feel impulsive, aggressive, or hungry. Colours can influence consumer behaviour to a surprising extent. They can change consumer perception and shopping choices.